Yogurt is milk that has fermented under the action of lactic bacteria. Certain specific bacterial strains convert part of the lactose into lactic acid. The milk coagulates when a sufficient quantity of lactic acid is produced. The curdling occurs by the combined action of two traditional fermenting agents: Lactobacillus Bulgaricus and Streptococcus Thermophilus. They produce the lactic acid and determine the yogurt’s characteristic flavor. The fresher the yogurt, the more viable bacteria it contains. The virtues of yogurt are associated, among other things, with bacterial action in the intestines, making bacterial presence in a sufficient number important. 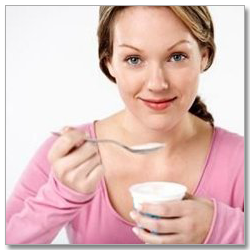 Yogurt must by law contain at least 100 million bacteria per gram at the time it is marketed. Natural unsweetened yogurt has nearly the same nutritional value as the milk with which it is made and is an excellent source of proteins, calcium (100 g provide about 15% of the daily recommended intake), potassium, phosphorus and vitamins A and B. In addition, yogurt provides all of the benefits associated with fermentation while only supplying very few calories. More than 90% of the yogurt can be digested within an hour, as opposed to 30% for milk. It provides an interesting and satisfying nutritional alternative for people with lactose intolerance. The National Yogurt Association (NYA) established its own criteria for live and active yogurt in conjunction with its Live & Active Culture seal program. In order for manufacturers to carry the seal, refrigerated yogurt products must contain at least 100 million cultures per gram at the time of manufacture. This level was based on a survey of leading research scientists involved in clinical studies of the health attributes associated with live and active culture yogurt. Custom Probiotics has formulated two yogurt starters in powder form. Formula 1 contains L. Bulgaricus, S. Thermophilus and L. Acidophilus, while Formula 2 contains additional two strains B. Lactis and L. Lactis. Both formulas are dairy and casein free, hypoallergenic, and do not contain any artificial colors, flavors, preservatives, sugar, gluten, soy or FOS. The bacterial count per gram of yogurt made will be above 100 million per gram, based on various independent lab test results that were performed on yogurts that we have made during our evaluations. The type and amount of microorganisms in yogurt affect lactose digestion and health benefits of yogurt. You can store our yogurt starters in the refrigerator or freezer. Our yogurt starters are highly concentrated and hence very little needs to be used. Our yogurt starters are likely to appeal to health-conscious individuals. Get 2 quarts (1.9 L) pasteurized, low fat or whole, cow or much preferably goat milk. “Goat milk is closer to mother’s milk, is much easier to digest and is less allergenic than cow’s milk”. Mother’s and cow’s. Let the milk cool to 100-103 F (38-40 C). 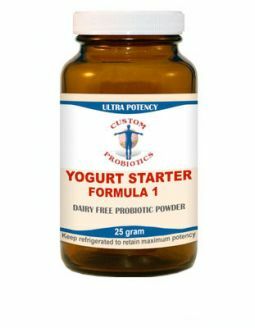 Add half a scoop (0.4 grams)of the Custom probiotic yogurt starter formula 1 or 2 per two quarts to one gallon of milk. Mix thoroughly with a spoon or beater until all the powder yogurt starter is well dissolved. Fill the resulting cultured milk in a yogurt maker of your choice and incubate at 100-103 F (38-40 C) for 12-24 hours. During fermentation, part of the lactose (milk sugar) converts to lactic acid, decreasing the pH values to a range of 4.25 to 4.5. The streptococci are responsible for the initial pH drop of the yogurt mix to approximately 5.0. The lactobacilli are responsible for a further decrease to pH 4.0. Refrigerate for at least five hours. Enjoy and share with friends and family. culture of choice – Custom Probiotics (recommended for GAPS/SCD), Cultures for Health Vegetal Dairy-Free starter, or HMF Superpowder are all good, available online. Look for dairy free. Pour a little coconut milk into a pint sized mason jar. Mix in culture of choice – a smidgeon of the Custom Probiotic, a quarter tsp of the HMF powder. Add the rest of the coconut milk. Cap tightly. Shake well. For Cultures for Health Vegetal Dairy-free starter, follow the manufacturer’s directions. Keep warm in a yogurt warmer, in an oven with the light or pilot on, in a dehydrator set at about 95 – 100 degrees, or wrapped in a heating pad set on low. Shake occasionally. Yogurt will be mild after one day, a little more tart after two. Alternate method – mix in culture of choice as described above and shake well. Leave at room temperature for 4 days, shaking occasionally. This method will result in a thicker product, with a slightly fizzy flavor.